Growing some or even all of your crops in containers offers greater flexibility – and opportunities too. You can grow edibles in pots that you can’t in your soil; easily move frost-tender plants under cover when it gets cold; or perhaps use containers to make the most of a suntrap patio. Let’s start with something sweet and most definitely tempting: juicy strawberries. Who doesn’t love the prospect of freshly-picked berries, ripened to perfection for maximum flavor! 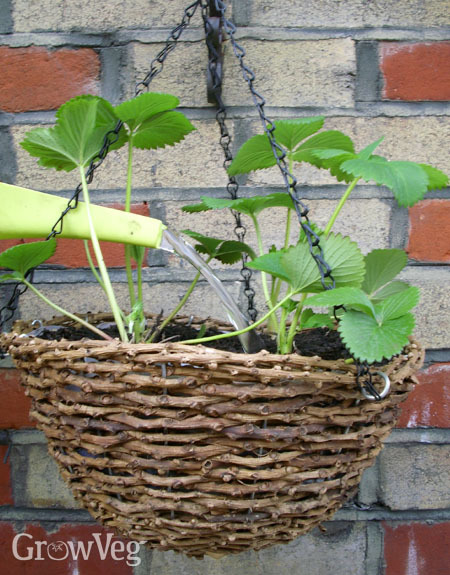 As well as pots, try growing them in guttering, hanging baskets or purpose-bought strawberry planters too. They need a nutrient-rich, moisture-retentive potting soil to really thrive. For best results mix some organic fertilizer into the potting soil before planting. Container-grown strawberries should escape the attention of most slugs, but you might still have to protect developing fruits from birds. Make sure birds can’t get under any netting you use. A mulch of straw or gravel will help to keep the fruits clean and the root zone cool and moist. Grow tomatoes in tubs and pots for an at-the-ready supply of fruits bursting with taste. Like strawberries they need lots of nutrients, consistent moisture and, of course, sunshine if they are to ripen their fruits to perfection. All types of tomato can be grown in pots, but stockier bush types and smaller tumbling varieties are easiest because they don’t need any pruning or pinching out as they grow. 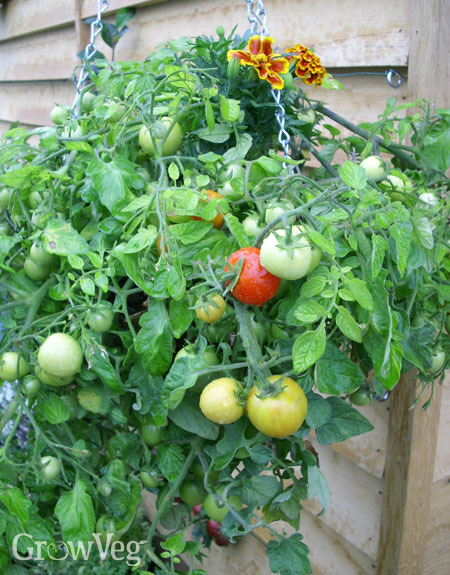 Tumbling tomatoes can even be grown in hanging baskets. Plant a few marigolds with your tomatoes – they’ll add some color and their scent is said to help to repel aphids. Use a potting mix that includes some added loam, which will help it hold moisture for longer. Closely related eggplant and peppers are also great candidates for container growing. Salad leaves are both quick and easy to grow, and because they’re shallow-rooted, make the perfect pick for a container crop. The whole plant can be harvested at once or as cut-and-come-again leaves, picked as and when you need them over several weeks. 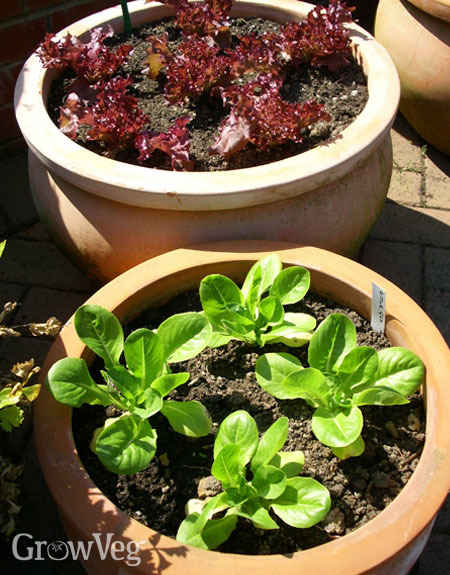 Extend the harvest by sowing a new pot of salad leaves every three to four weeks. Towards the end of the season, protect the plants with row covers or move the pots into a cold frame to keep the leaves coming for even longer. Sow a mixture of leaves for a range of leaf shapes, colors and textures. Lettuce is the obvious choice, joined by the likes of arugula, mizuna and mustard. Pots of other salad staples, including radishes and scallions, are natural partners to your leafy lovelies. Smaller varieties of carrot are exceptional crunched raw as part of a salad or lightly steamed to preserve their sweet taste. They’re just the job for tall containers because growing them this way means they’re less likely to be attacked by their low-flying nemesis, the carrot fly. 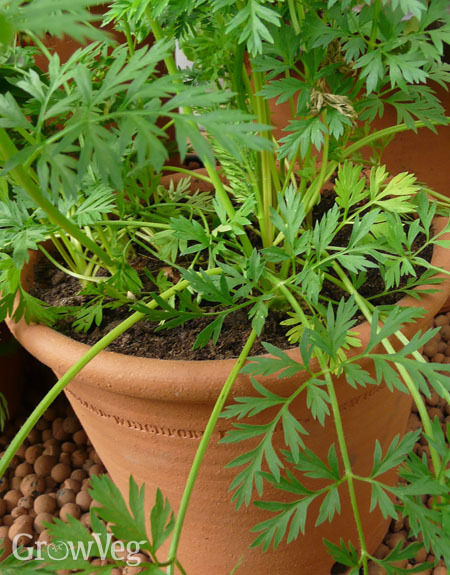 Sow carrots throughout spring and summer, starting the season with a hardier, early variety. Mixing the tiny seeds with sand will help to space them out as you sow, though it’s likely some thinning of the seedlings will still be necessary. Harvest finger-sized roots in stages, taking the biggest first so that those left can continue to grow. Swiss chard is another eye-catcher for pots! Our fifth container crop is Swiss chard – a prolific leafy vegetable with a very long harvest period, making it exceptionally hard working for the space it occupies. Varieties come in a range of truly spectacular stem colors that almost appear to glow against the light. Chard isn’t just productive, it’s a bit of a head-turner too! Sow chard directly into containers from spring, or start them off in plug trays to plant as seedlings. Plants should end up at least six inches (15cm) apart. You should be able to pick your first leaves about three months after sowing. Pick little and often to encourage more leaves to follow. Kept well fed and watered in dry weather, chard can potentially crop until well into autumn, and in milder areas throughout the winter. Container-grown crops don’t have very extensive roots, so you’ll need to keep plants hydrated in dry weather, watering up to twice a day in summer. Nourish plants with liquid fertilizer during the growing season. Tomato feed that’s high in potassium is good for both tomatoes and strawberries, while a general-purpose feed such as liquid seaweed is suitable for most other potted crops. Direct sunshine is almost always welcomed, but leafy salads and chard may prefer a shadier aspect in relentlessly hot conditions. So that’s our top five crops for pots - I hope you’re tempted to grow at least a few of them! There’s probably a crop we haven’t mentioned that would be in your top five, so tell us what it is and why in the comments section below. "My favourite is potatoes. A large container can provide lots of fresh potatoes that can last in storage for five or more months. - Margy"